What is a "bump stock"? The third-ranking Republican in the Senate said Tuesday that he thinks the upper chamber might "take a look" at the idea of regulating bump stocks, which the Las Vegas shooter used to transform semi-automatic weapons into automatic weapons. 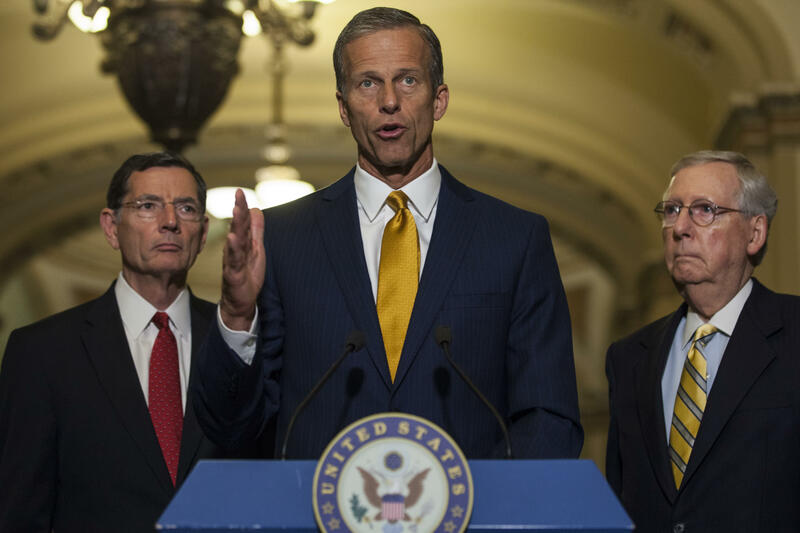 "That's something I think we'll take a look at," Sen. John Thune, R-South Dakota, told reporters when asked about the bump stocks and semi-automatic weapons being illegally converted to fire fully automatic. Another Republican, Sen. Lindsey Graham of South Carolina, said it would be a "good time" to have a hearing and he suggested he would consider looking at bump stocks. "I'm not an expert on bump stocks, [but] all things that make America safer and don't infringe on the Second Amendment, count me in," Graham said. In an appearance on MSNBC's "Morning Joe," Rep. Tom Cole, R-Oklahoma, agreed that it ought to be looked at, and House Freedom Caucus Chairman Mark Meadows told the Wall Street Journal he was unfamiliar with bump stocks before the Las Vegas shooting. "I own probably more guns than most members of Congress and that was the first time I'd ever heard of a bump stock," he said. "There is a prohibition against automatic weapons…anything that would try to make it an automatic weapon would need greater scrutiny, let's put it that way." Rep. Peter King, a New York Republican, said Wednesday he's inclined to support a ban on bump stocks, too, though he needs to learn more about them. Sen. Dianne Feinstein, D-California, is already introducing a bill that would ban the sale, transfer, importation, manufacture or possession of bump stocks, trigger cranks and similar accessories that accelerate a semi-automatic rifle's rate of fire to emulate fully-automatic fire. A dozen of these devices were found in the hotel room of the Las Vegas shooter. The measure has 26 Democratic co-sponsors. "Some said we shouldn't do this now; now is not the time. Ladies and gentlemen, when is the time going to be there?" Feinstein said at a press conference. "No better way to honor the 59 people who were slaughtered than to take action to prevent this from happening yet again. If not, when will we ever do it?" Sen. Claire McCaskill, D-Missouri, who said she had been briefed by the FBI on Monday, said that addressing the issue of bump stocks would be a "very meaningful, small step." McCaskill serves as the ranking member of the Senate Homeland Security Committee. "I think one thing this tragedy may present to us is taking some action against the technology that's been developed that converts a weapon to an automatic weapon," she said. "We know that he had bump stocks in the room, we don't know if they were utilized but it would make sense based on the rapidity of the fire that occurred towards that crowd." It remains to be seen whether other Republicans will agree that it's worth looking into legislation on the matter. Some are saying it's not the answer to a mass shooting. "We can have that discussion at another time," said Sen. Thom Tillis, R-North Carolina. "But it's a typical political tactic by some on the left." Sen. John Kennedy, R-Louisiana, said "I do not think that the United States Congress can legislate away evil." CBS News' Alan He, John Nolen and Emily Tillett contributed to this report.